Should the robust barrel of the Urbano be too wide, welcome to a more slender version. Maintaining a striking blend of high-tech materials and classic styling the Link series features innovation and geometric symmetry. 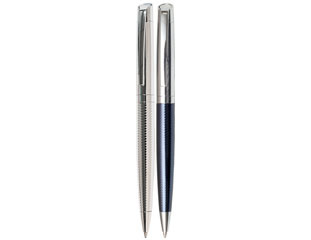 Made from the same combination of patterned rich lacquer and chrome with a spring loaded clip and conical top, the Link ball pen captures pure elegance.